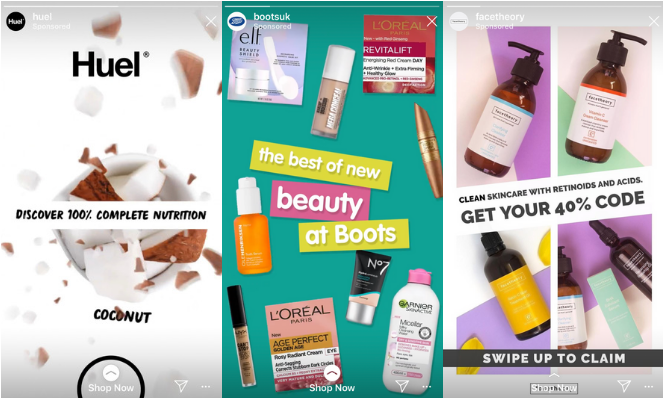 Are you using Instagram Stories ads yet? If not you should certainly consider them. 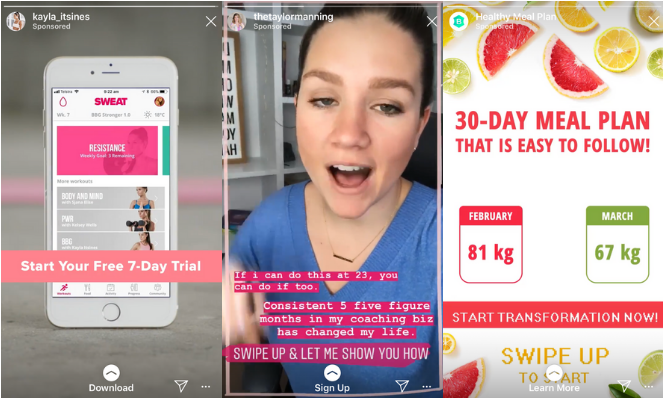 Instagram story ads could be the answer to increasing your brand awareness, gaining more followers, and of course boosting your sales! There are currently 500 million people using stories every day, and over 60% of users login to Instagram every day! 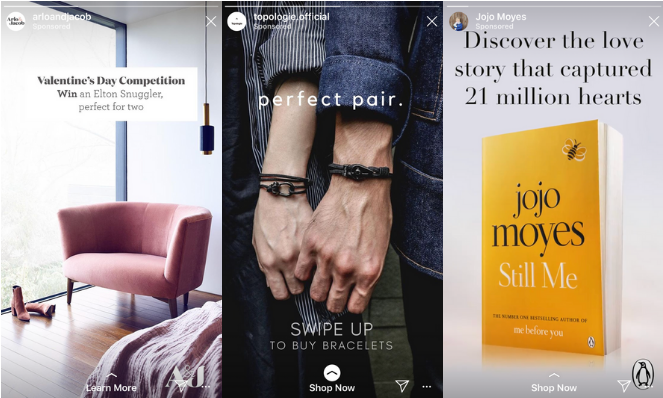 Currently within the stories feed, every 4th story is given to ad space. However, small businesses are only just starting to consider story ads. Which means you are a perfect position to get ahead of your competition and there is huge opportunity for your brand to be discovered. It’s all too easy (and pretty tempting) to use the same ad format for your story ads as you would for your other placements. But doing this means your ad not only looks naff, it also has a far lower chance of success than if you were to create it with stories in mind. Using an ad which was designed for the newsfeed means your text will be cropped and you will stand out for all the wrong reasons. Stories are portrait orientation & fill the whole screen. When they are done right they can fit seamlessly into the feed without standing out as an invasive advert. So ensure you consider the format of your story ads before throwing your money at them. Story ads are short, so you have to get the message across quickly. Make sure any text is large and the message is to the point. Avoid any unnecessary jargon. Ditch the long form copy and try to get the message across in as few words as possible. Just like these brands have. People are time poor and have really short attention spans these days. When scrolling through social media, video can be really useful for capturing our attention. So it makes sense that adding video to your story ads will help to capture peoples attention, and keep it! How do you use video to grab peoples attention? The key with all video on social media is to make sure the first 3 seconds catch their attention and ensure they want to watch more. Ditch the boring intro’s and movie like trailers and get straight to the point. When using video in ads it’s even more important as the viewer won’t know you and is more likely to keep scrolling. Your job is to entice them not to! Shocking I know! But when your stories are highly produced they stand out as adverts and you’ll immediately lose people’s attention! Instagram stories are used organically for behind the scenes, raw, un-curated, casual content. So if your story ads fit in with what your audience are used to seeing they stand more chance of success. I’ve often started watching someone talking to camera without realising it is an advert and have watched far more of their ad than I might have if it had been perfectly produced and edited. You can get away with your ads not being perfectly perfect, as long as you are strategic with them. Your strategy needs to include your audience and messaging in general but you can increase their chances of success by being strategic about where you position your messaging. Drawing the eye away from the ‘sponsored’ tag in the the top left of the screen and focusing the viewers attention on your message will increase your chances of success. You can do this by positioning your text, images and any graphics or logos in the centre or bottom of the screen. Notice how your focus is drawn to the bottom of the screen in these ads so you don’t immediately notice the ‘Sponsored’ tag at the top of the screen. 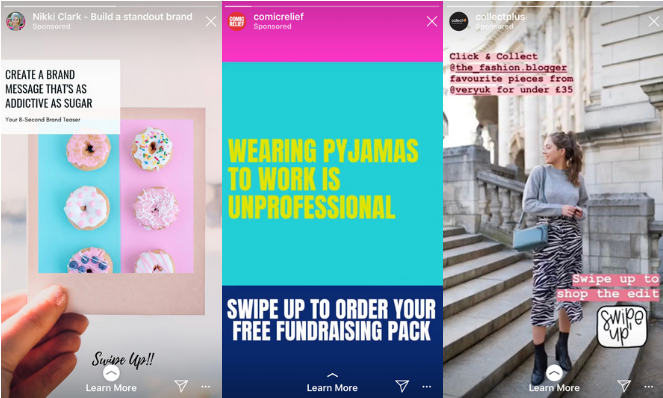 We are all used to seeing the same fonts, colours and stickers on instagram stories so consider using those in your story ads. By doing so your ad will fit seamlessly into the stories feed, just like the advert from Collectplus below. The benefit of using ads is that you get the swipe up option regardless of how many followers you have (without ads you need 10k followers to get the swipe up function). But you still need to make sure you draw peoples attention to it and encourage them to use it. There are some great examples below of brands who have reminded their viewers to swipe up. 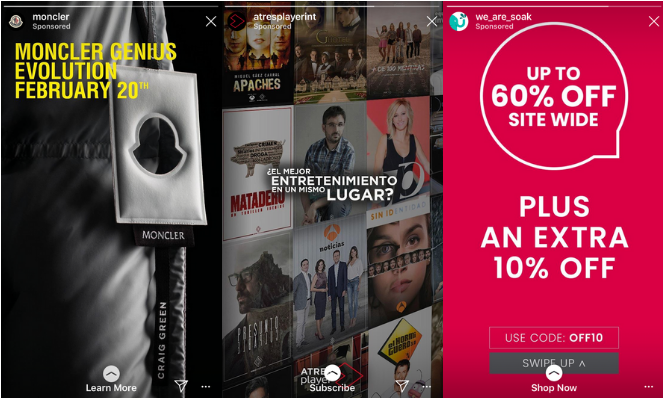 Collectplus (right) uses native Instagram text to ensured their ad fits seamlessly into the stories feed. Although the ‘shop now’ swipe up option may have worked better here. The most important thing when creating any ads, for stories or other placements, is to put your audience at the heart of everything. Ensure you know exactly who you are talking to. Remember their pain points, sell the sizzle and ensure you are talking in their language (literally and figuratively!) Ensure your message is clear to people who don’t know your product / service. I recently got these ads in my stories feed. One was in Spanish so I couldn’t even understand it, and the others meant nothing to me as I didnt know the brand and had no idea what they were selling. Needless to say I carried on swiping as they’d clearly not been created for me, and as such the brand had wasted their budget on showing them to me! 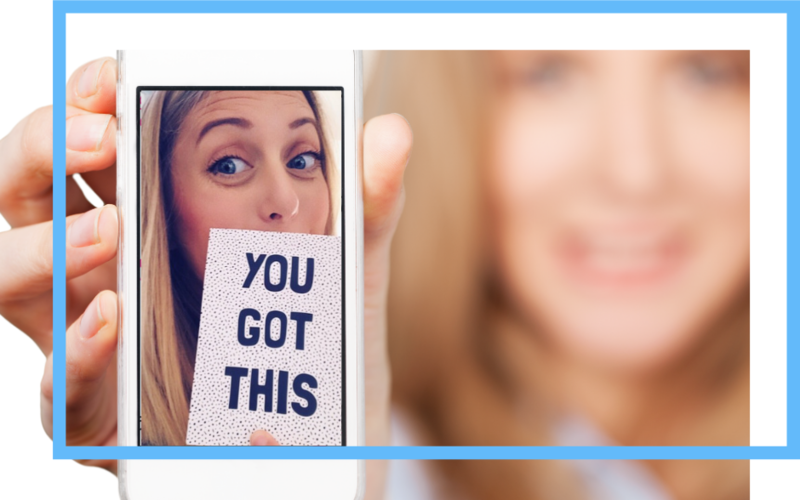 If you are unsure on how to get started with story ads or any other form of Facebook & Instagram marketing get in touch to see how I can help you.